Accompanied by professional soloist and orchestra, the concert will feature Bach’s Magnificat with soprano soloist, Kerry Holahan. Also known as the Song of Mary, The Magnificat is one of the eight most ancient Christian hymns. The text for Magnificat comes from the portion of the Gospel of Luke which depicts the story of Mary, now pregnant, visiting her cousin, Elizabeth. Soprano Kerry Holahan is heralded for her masterful interpretation of Baroque cantatas and oratorios, particularly those of J.S. Bach. She maintains an active performing career in the greater Washington, D.C. area. The concert will also include performances of several seasonal pieces in French, German, Spanish and old Slavic. Save $5.00 off the door price by ordering tickets either online (click the Online Purchase link below), or purchase tickets at one of the local vendors below. Celebrating more than 60 years of classical music! 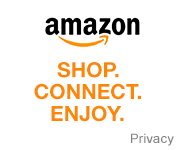 The Harford Choral Society, Inc.
Support Harford Choral Society and shop Amazon using the logo below. You may also click here for other ways to support. Join the HCS mailing list! Enter your name & e-mail below. © 2018 Harford Choral Society. All Rights Reserved.